This tasty apple sauté is a great side dish to serve with pork chops or roast or baked ham, and they make an excellent side dish with a hearty breakfast. Or, add some whipped cream or ice cream and serve the apples as a dessert. Fried apples have long been a favorite in the South, and it's easy to see and taste why. It's a simple country-style preparation with a bit of sugar, butter, and cornstarch—ingredients you likely have on hand. Lemon juice keeps the fruit from browning and adds to the balance of flavors. The brown sugar gives the apples caramel flavor and makes an attractive dark sauce. If you are serving the sautéed apples as a side with savory dishes or if the apples are quite sweet, feel free to cut back on the brown sugar. Peel the apples; core them and slice them into thin wedges. Toss the slices with lemon juice as you add slices to a bowl to keep them from turning brown. In a large saucepan or skillet, melt the butter; add apple slices and sauté over medium heat, stirring constantly, for about 6 to 10 minutes or until tender and just beginning to change color. Combine cornstarch and cold water; stir into the apples. Gently stir in the brown sugar and spices. Bring to a simmer; reduce heat and simmer for about 3 to 5 minutes, or until the apples are tender and the sauce is thick, stirring a few times. Add extra water, a tablespoon or two at a time, as needed. 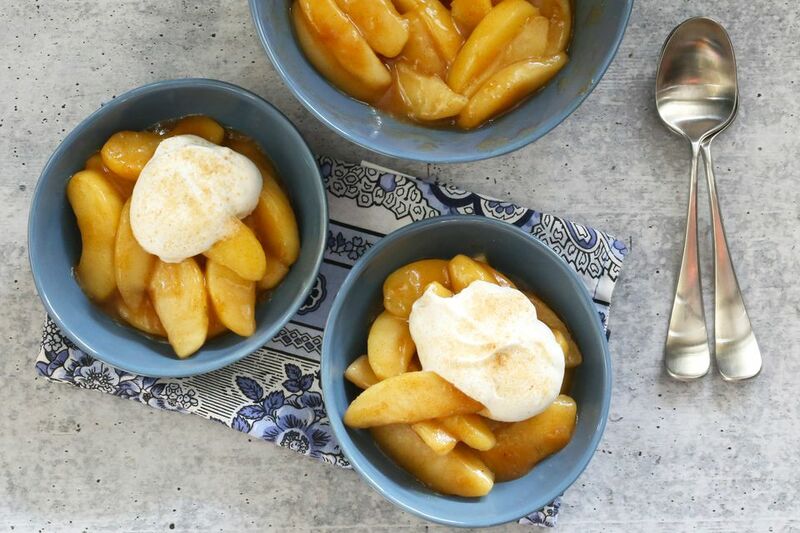 Spoon the warm apples into serving dishes and top with a scoop of ice cream or a dollop of whipped cream. Some apples are more suitable for cooking and baking, while others are best for eating out of hand. Other apples break down, making them ideal for sauces. For sautéed or fried apples, choose a variety of apple that will keep its shape. Some good choices: Fuji, Granny Smith, or Pink Lady apples. Choose firm apples with good color and fragrance. The apples should be free of cuts and bruises. Store fresh apples in the refrigerator in a plastic bag or in a cool, dark place. To make a small amount of cinnamon sugar, combine 2 tablespoons of granulated sugar with about 3/4 teaspoon of ground cinnamon. Store leftover fried apples, covered, in the refrigerator for up to 4 days. Freeze fried apples in zip-close freezer bags for up to 6 months. For saucier apples, double the water and cornstarch. Replace the water with apple juice; add the cornstarch and whisk to blend. Replace the cinnamon and nutmeg with 1 teaspoon of apple pie spice. Add a splash of bourbon—about 1 tablespoon—to the apples along with the cornstarch mixture. Add a handful of raisins to the apples about 5 minutes before they are ready.